Do computers and the Internet enhance Democracy? This is the year cyberpolitics came of age. 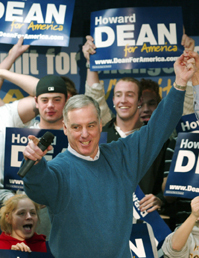 Building his organization and fundraising efforts online, Howard Dean sped to an early lead in the race for the Democratic presidential nomination. Despite Dean's ultimate failure, other candidates emulated his online tactics, raising a record amount of campaign cash from small donors in the process. MoveOn.org — an Internet-based advocacy group started at home in 1998 by two California activists — became one of the most prominent players in the electoral and public-policy debate, cracking the $30-million mark in fundraising and claiming 3 million members. The Defense Department began, and then abandoned, an effort to enable military personnel overseas to vote over the Internet, while Michigan Democrats added online voting to their presidential caucuses. Exploiting other information technology, political organizations mined computer databases as never before, and election officials touched off heated controversies by switching to electronic voting machines.